Embrace a state-of-the-art kitchen with the Kraus undermount sink. Constructed with 16-gauge stainless steel, this sink is engineered to funnel water into a drain and prevent sitting water. Including a corrosion and rust-resistant finish, bottom grid, and basket strainer, this sink is a top-grade, beautiful, professional piece. We are so happy with this Kraus 30-inch undermount stainless steel sink. Bought it back in Nov 2010, but didn't get installed or used until Jan 2011, due to construction delays. It is beautiful -- our contractor and others involved in the project commented on it. While shopping around, we thought it might be too deep, mounted under 1.5 inches of granite countertop. But paired with a high-arc faucet (Kleo by Moen), the depth really contains all spash. Every pan and serving tray can fit in this sink! What a luxury! Near-zero degree radius corners lend that professional look without being hard to clean -- the pull-down spray nozzle flushes debris back to the drain without a problem. It is high-quality, low-gauge stainless steel at a reasonable price, for the size of the bowl. Also loved that the sink grid is included -- would have been an extra purchase otherwise. This sink has a rear-positioned drainage opening -- check to be sure there is enough clearance between it and the rear wall of the cabinet opening to accommodate the garbage disposal, if using one. The packaging was impressive, as other reviewers have mentioned. And for a first-time overstock.com buyer, we found this was a really easy and satisfying place to shop, even for so big-ticket an item. If you've never had a single basin sink, it's time to make the switch! I put one in my previous house and fell in love. My new house has a double basin. Switching to a single basin was my first order of business! You can fit large pots, including their handles, in the sink. you can fit entire cookie sheets flat across the bottom. My 70 year old parents converted to a single basin after staying with me and they would never go back to double basin. The only downfall to a double basin is wanting to dump things down the drain when you have a sink full of soapy water. You learn to make adjustments immediately because you'll love the large capacity. Nothing is too big to fit and wash in this sink! Kraus is a German name, but it's a Korean product. I was instantly leery of a Korean product, but this sink gets great reviews on several other sites. The true test comes after installation, which has not happened here yet. I will review again at that point. Amazon had loads of very high reviews on this specific sink. I paired it with an industrial faucet (American Standard 4332.350.075 Pekoe Semi-Professional Single Control Kitchen Faucet, Stainless Steel) and couldn't be happier with the quality and look of both. I wanted a great big sink and I got one. I can soak cookie sheets, broiler pans and my turkey roaster and still have room left over. However, I was disappointed because the sink came with a stainless steel rack that was supposed to sit in the bottom of the sink to protect the sink surface from being scratched by sharp edges of pots and cutlery. The rack is made to the exact dimensions of the sink, but because this is an undermount sink the overhang of my soapstone counter top makes it impossible to get the rack into place. If you are using this as part of a kitchen remodel tell your countertop fabricator to to take this into consideration. Great Sink! Big! Bold! Cool! We considered the reviews before purchasing and we were not disappointed. This is a great looking sink. There are have been several good comments by others. Things to keep in mind, we are remodeling our kitchen and our sink cabinet has one of those pull down "compartments" in the front - where you would put sponges, etc. 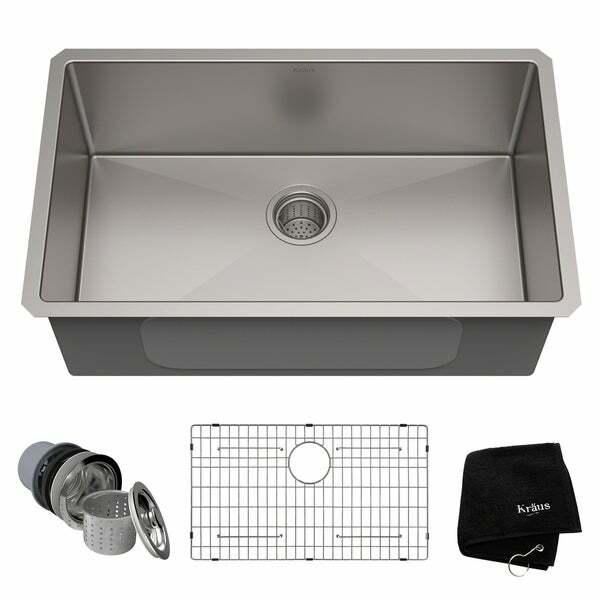 We were considering the 32 inch Kraus sink but were concerned about the space that woudl remain for a faucet. We are happy that we went with the 30 inch Kraus sink as we have room for our faucet AND the pull down compartment still works. It would not have worked with the 32 inch sink. This is a big sink, but looks great in our kitchen - which is not very big. I bought this sink as a replacement for my existing porcelain sink when I decided to re-tile my kitchen counter top. I wanted to stay with a single sink as was my original. My existing sink was done under mount tile in. I wanted to do the same thing as I don't like drop in sinks with a lip on the counter top. This sink I chose is 16 gauge stainless. All the stainless steel sinks I had looked at in various stores were 20 gauge which were a bit too thin in my opinion. Of course a 16 gauge sink costs more but I wanted to make sure I would be happy with my choice since I only planned on doing this job once. When I got the sink I was struck with the depth of this thing. It looked deeper than I expected (even though I knew the dimensions). At first glance my wife thought it was too deep but I think after she uses it for awhile, she will come to like the benefits of a deeper sink. My tile job is now complete and my new kitchen counter top looks great. The original counter top was done in the "50s so now it is modernized up do date. This sink in the counter top looks great and is very well made. I like the insert that goes in it and the little basket in the sink drain. I also like the forward facing drain position. This is my first stainless steel sink so I have to get used to the extra attention that stainless steel requires (such as cleaning water drop stains, etc). All in all very satisfied with this sink. Let me explain my 'Average' rating. I love this sink. It fits my needs perfectly and the steel bottom grid is a nice touch. However, the drain/strainer had a cheap plastic part that not only would not seal properly but would deteriorate over time. My plumber had to install a different drain/strainer, one that matched the quality of the sink. How disappointing it was to see that cheap part in this expensive sink. Would I buy this sink again. Yes, but I'd have purchase a separate drain/strainer. When I get this sink installed, it will be the final jewel in the string of shining stainless fixtures gracing our kitchen redo. Sometimes the pictures look good but the product falls short. Not the case with this Kraus undermount deep stainless sink. I did not expect to have it in a fabric sack to keep it untarnished. I did not know the manufacturer would supply a black towel for keeping it polished. Nice touches up front, even before I have the sink in place. The finished details are all great. No burrs exist on the rim nor on the drain hole. The sound deadening insulation outside the sink is neatly applied and looks super durable. There is a template to use when cutting the hole in the countertop. The corners are smoothly rounded off to make cleaning easier. There is a sturdy drain rack for the bottom of the sink, minimizing the occurence of scratches. I know there will be scratches, because this sink is roomy enough for working on my house plants, bathing the small dogs, and washing things too big for our previous kitchen sink. The contractor is the one who will install this sink for us, when the time comes. Meanwhile, it is repacked in the super sturdy shipping container which arrived quickly and was not damaged at all. Altogether, a happy state of affairs. This sink was purchased for my condo renovation and after its installation, I couldn't be more pleased. At first I thought it might be too big for my 33 wide base cabinet, but after one month of use, I am glad I chose it. It easily accommodates large pans and is deep enough to hold them out of sight off counter until ready to clean them. Also convenient for filling large containers for cleaning and gardening purposes. The sink itself is beautifully designed and constructed as well as easy to clean with a durable finish that retains its shine. It is heavy, deep and well insulated, with no splash back onto counters or adjacent surfaces I have found the bottom rack and large drain cup included so convenient that I have delayed having a garbage disposal installed and may forgo one completely. Packaging was among the best I've seen and installation was easy. At just under $300 with free shipping, this product is a great value. This sink literally blows away the competition. Highly recommended! I wanted a wide, deep stainless single bowl kitchen sink to be able to temporarily hide, soak, and wash any dishes and pots and pans. Having been very unhappy with a flimsy stainless sink before, I did my research on stainless gauges, and this one is definitely heavy-duty. When we were choosing granite countertops, we could have gotten a "free" stainless sink with the deal, but it was not as big nor as thick of a gauge. The grate at the bottom is key; I would think any stainless sink would be prone to scratching without it. We liked this sink so much that we have ordered another one for a new place we just bought. Although it comes with a thick towel intended to wipe down the sink after each use, I have not seen the need to do that. It cleans easily with a soft scrub brush I use on dishes. Initially we ordered the 32" sink because that was the size of our old one, however the old sink had a partition (2 basins). When the 32" came it was HUGE and it's also 1" wider, which doesn't leave enough counterspace around it to install a faucet, etc. So we sent it back (very easy) and ordered a 30" sink. It arrived in 7 days, but was not an issue as we're still waiting for the granite. It appears of superior quality (16 grade) and it looks beautiful - I have no doubt that it would enhance our new kitchen - can't wait to see it installed! The single bowl seems to be a much better choice these days, as you can fit and soak ANY pan in it. Very impressed by the build quality and weight of this sink. Absolutely blows away anything else in this price range. Looks like it cost way more than it did. No compromises at all. 16 guage makes a lot of difference. Nice looking sink, and heavier than most knock-off is the same price range, but seems like it's soft metal. I buy a lot of sinks through my business, and this one seems to get scratched very easy. Don't think twice about buying this item. It's an awesome sink. love the more squared off corners. I have used a large single style sink for years, but they were the drop in style. love, love , love the under mount style. and the sink drain is great. comes with sink and has a basket with handle for removing garbage, and has a stopper to plug the drain. never seen any like this design. Nice strainer insert as well. This sink comes packaged in a kraus fabric sewn bag. Very, Very, Very nice. can't beet this and the price is great. Thanks Overstock. This sink is the BEST!! I just had my new quartz countertops installed today with new sink and it exceeds my expectations! The owner of the company that installed my counters said this was one of the nicest, heaviest sinks he's ever seen and he sees many. He could not believe I got it for the price I did. Although I haven't used it yet - I can't wait to - almost makes me want to do dishes! Don't hesitate - this is a great, high quality sink that looks much more expensive! Beautiful sink!! When it arrives it was packaged perfectly and it came with all sorts of fun bonus items. You can tell they know you are purchasing the Cadillac of sinks and it arrives that way. Beautiful. Sturdy and modern. The design complimented my European style kitchen remodel. The grill fit perfectly and the rubber bumpers offered good pectin against scratches. The drain is a nice didn't but I opted for a disposal and didn't use it. The best part of sink is how solid and "heavy" it is. It is sheathed in rubber so that it is so quiet and solid when dishes or pots and pans or in it. The craftsmanship is far above sinks that cost 3 times as much. I would recommend this sink if you are looking to spend less but get high quality. Gorgeous even though it can only be undermounted if you have non laminate countertop, so for instance granite would be fine. LOVE this sinks. The only issue is that I bought the same thing through Amazon for way less. They actually sent me two. However, I would have never found this without overstock Overstock still my to go the source. This sink is so pretty and so stylish. It is going to look great in my new kitchen. Very high quality. Delivery came very quickly and packing was great. OMG! This sink is perfect! Love this stainless steel sink. I used this on a recent kitchen remodel and saved $$ by purchasing this item on Overstock. So far it is fairly easy to keep clean. We've had it since 2010, so about 9 years of daily use. It's held up very well and continues to work as an integral part of the kitchen. What's great: the thick stainless steel - no dent after 9 years; sound barrier coating - no tinny sound when the water hits; dish grid - debris can be washed away below the pans/dishes and protects the bottom surface; deep basin - swallows stacks of dishes; and single bowl - accommodates large pans with handles, entire baking sheet, or a large roasting pan. Our 30" sink just fit into the 30" Ikea cabinet. The simple rectangular design with near 90 degree corners work well with modern design. The kitchen sink is used (sometimes abused) daily. This high quality durable product has been well worth the investment. This item is highly recommended. "Would this fit with an opening of 30.5” x 16.5”?" Hello, Thank you for your inquiry. Please be advised this sink requires a minimum cabinet size of 33 inches. "Is the model number on the sink KHU100-30? " "I'm confused, does this sink come with a hose/faucet or just the sink?" It's just the sink. You need to buy your faucet separately. "Wondering if it is it too deep for a standard garbage diposal to fit under the sink?" I put a standard garbage disposal in. Plenty of room. I love this sink! Gives a "professional" feel to the kitchen. "Will this fit in a 34"wide cabinet?" Needs a 31" min width to hang. Our base was 39". Love the sink! You should not have a problem. I fit mine in a 33" wide base cabinet, but with little room to spare. Be aware that because of the overall size and in particular, the depth of the sink, you should check with your plumber if you wish to install a garbage disposal. I elected not to and have absolutely no regrets. This product is extremely well constructed, functional and attractive, and at this price point a bargain. One of the best features of my kitchen remodel. "I assume installing a garbage disposal would be fine on a this single basin sink, right? Thinking about making the conversion with my new counter top install." We had no problem fitting our badger disposal underneath the sink.
" I understand that one of the purposes of the rinse grid is to protect the bottom of the sink from scratches. I am wondering about all the other areas of the sink though… Do those get scratched up? I have been told that stainless steel scratches easily. "